Deciding on a gift can be a difficult and frustrating process. As the gift-giver, not only must you choose what to give but you must also figure out how much to spend on the gift. Thankfully, for wedding gifts, there are a few variables that can help you through the process of landing on a gift for the groom and his bride. But before we go about listing your wedding gift options, let's first talk money. 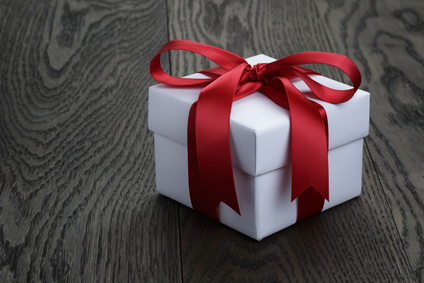 Money: Gifting money is never a bad idea and is always appreciated. You should already know your wedding gift budget so you're set. Place your gift in an envelope and hand it directly to the couple or to the person assigned by the couple to handle their enveloped gifts. And, no matter the amount, a check is better than cash in case your gift is lost or stolen. By the way, if you want to get an idea of a number or range, check out this website that calculates how much to give at a wedding. Group Gift: In our post, The Best Man Responsibilities, we mentioned proposing to the groomsmen the idea of giving a group gift. It's not a bad idea to consider ganging up with the other groomsmen on a big-ticket gift like a BBQ grill, TV, fancy pot and pan set, etc. These items can cost at least $600 each but, if gifted as a group, your portion of the tag is way less. Also, since most guests shy away from pricier registry items, you and the groomsmen will become even bigger rock stars because of your big-ticket group wedding gift. Pay for a Wedding Vendor: Offer to pay for the entire, or part of the, cost of one of the couple's wedding vendors. It will help the couple immensely cost-wise and you will further ingrain your role in your friend/relative's wedding. Gift Your Services: If you're a professional or a business owner of a service that can be integrated into a wedding (i.e. cigar rolling service, tailor, chef, florist, etc. ), you can gift the couple with a complimentary or discounted service. If you decide to take this route, just make sure it won't interfere with your best man duties and inform the couple of your gift ahead of time so they can plan and budget accordingly. Frame Your Speech: Write your best man speech onto a fancy piece of paper and then frame and gift it to the couple. Or, if your handwriting is more chicken scratch than fine art, hire a professional calligrapher to write it for you. This is a very personal and sentimental gift. Wrap Your Gift: If you're like most guys and can't wrap to save your life, recruit your mom, girlfriend or wife for help or take advantage of the store's gift wrapping service. (Stores with a wedding registry program offer wrapping services for free or a minimal fee.) P.S. Generally, there is a table at the wedding reception dedicated to boxed gifts so, upon arrival, search for the designated area and drop the gift to leave you free to mingle. Have It Mailed: Consider having the gift directly mailed to the couple. This will save you, and eventually the couple, from lugging a box around. Just make sure to notify the couple of your gift by giving them a card during the wedding. Also, if you decide to order the gift after the wedding, don't wait too long to do so. And, of course, don't forget to have it wrapped. At the end of the day, there isn't a right or wrong to wedding gift giving. As long as your gift is genuine and responsible, you can't go wrong.